Chris Haines Motorcycle Adventure Company has teamed up with Make-A-Wish Foundation of Central and Western North Carolina, to grant Lenoir teen Justin Richardson an exhilarating week of off roading fun in pristine Baja Mexico. “Riding dirt bikes has always been my thing,” stated 17 year old Richardson, who proved his mettle out on the rugged Mexican terrain. After suiting up in pro Fox Head Inc. gear and saddling up on premier Honda dirt bikes, the entire Richardson family set off for the adventure of a lifetime to the peninsula’s tip. Haines’ team navigated the Richardsons through the same majestic landscape, witnessed centuries earlier by Conquistadors in their discovery of Baja. The route included beautiful towns like San Quintin, San Ignacio, Loreto and La Paz; and covered most of the traditional point-to-point Baja 1000 race course. The Journey Culminated at the exquisite Finisterra Hotel at the tip of Cabo San Lucas. Justin and family thoroughly soaked in this sport fishing Mecca before hopping on the long plane ride back to reality. The Make-A-Wish Foundation grants the wishes of children with life-threatening medical conditions to enrich the human experience with hope, strength and joy. Founded in 1980 when a group of caring volunteers helped a young boy fulfill his dream of becoming a police officer, the Foundation is now the largest wish-granting charity in the world, with 66 chapters in the United States and its territories. With the help of generous donors and more than 26,000 volunteers, the Make-A-Wish Foundation grants a wish every 40 minutes and has granted more than 174,000 wishes in the United States since its inception. For more information about the Make-A-Wish Foundation, visit Make-A-Wish Foundation of Central and Western North Carolina or Make-A-Wish Foundation and discover how you can share the power of a wish. 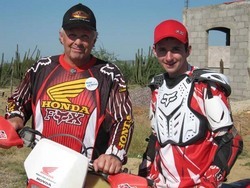 Owner /director Chris Haines is a 30+ year veteran of riding, racing and winning in Baja, and considered to be the world’s #1 off-road tour operator. Chris Haines Motorcycle Adventure Company is partnered with the Honda Rider’s Club of America and is proud to offer exclusively the newest Honda motorcycles and ATV’s. 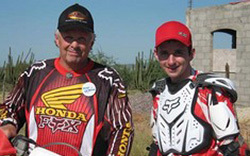 Chris is the leading motorcycle class title holder in the Baja 1000 with a total of 13 wins. His most recent win of North America’s most grueling off-road race took place in November of 2007, making Chris one of only 6 competitors in the 40 year history of the Baja 1000 to win both Ensenada to Cabo San Lucas races. In 2001, Chris was awarded the prestigious “Amigo de Baja California” award by the Governor and Secretary of Tourism of Baja California. The honor reinforces Chris’ outstanding decades long relationship with the people and government of Mexico. This esteemed accolade is bestowed on individuals who have demonstrated leadership in the promotion of Baja Mexico tourism, and thus earned the respect and appreciation of the Mexican government. As motorcycling’s most publicized and respected tour director, Chris has risen to near celebrity status – enjoying unparalleled media recognition and satisfying high profile clients. Chris Haines Motorcycle Adventure Company has recently expanded its roster of Baja off-road adventure offerings to include rides for dads, kids, and families – exclusively on Honda motorcycles and ATV’s Honda Rider’s Club of America. CHMAC additionally offers leading racing gear from Fox Head Inc Fox Head Inc.